If truth be told, when the author of the first blog on my blogroll asked me to visit her blog because she “had something for me,” I put it off because it involved a little more clicking than I wanted to do at the moment. And, if truth be told, she is first on my blogroll only because it’s an alphabetical thing. Her blog is A Bit of the Blarney by GrandmaK. Her name is Cathy Keller and I have just immersed myself in her blog. It is so pretty and charming, with pictures, and family, and substance that if she didn’t already have this award, I’d give it to her! But, imagine! – she, having received it, in turn gave it to ME! My sincere thanks to Lisa at Are We There Yet and Eileen at Umma’s World for this delightful award. Both of these ladies offer me a place to go and enjoy the environment and down home friendliness. I will try to do justice by them in accepting this award and sharing a bit of who I am. 2) Share “ten honest things” about myself. 4) Tell those 7 people that they’ve been awarded HONEST SCRAP and inform them of these guidelines in receiving it. Of course, accepting this reward and doing justice to it involves more work. Now I not only have to pick out 7 brilliant blogs but share “ten honest things” about myself. Gadzooks! 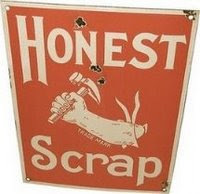 Then there was the problem of getting that “Honest Scrap” picture from her blog to mine. People, you must be careful about the strains you put on old brains. To top it all off, one has to wonder about whether it is a good idea for each awardee to choose seven other blogs to be similarly awarded. It would seem that pretty soon every one would have one and it would be worth nothing. Just a thought. Now let me tell you about my real reward at Cathy’s blog. No sooner did I log onto her blog than I was assaulted by the sound of very loud applause. As it turned out, Clay Aiken was singing and crowds were making that racket. Once I discovered that GrandmaK had a playlist of songs, I was able to quiet Aiken and move on. I was SO IMPRESSED with her musical selections and their variety I just listened and listened until I had sampled all 43 of them. I loved Mariah Carey’s O Holy Night and Ray Charles’ America, the Beautiful. Marching songs always move me and she had Anchors Aweigh, the Army Air Corps Band, Stars and Stripes Forever, as well as The Caissons Keep Rolling Along (Daddy sang that in WW I but his version differed. Where this one goes Where e’er you go, you will always know, the caissons keep rolling along. Dad would sing: With a three-inch gun, we’re going to get the Hun..…). Also, three Michael Talbot selections, two of Ode to Joy, Amazing Grace, Time in a Bottle (Jim Croce), Tantum Ergo, On Eagles’ Wings. As I say, I just listened and listened. Thank you so much, Cathy. I think my ten honest things and seven re-awards will be post-poned (pun)!